Anyway, not many pics of the road trip today, but it’s always fun to run in a hotrod! Brett, My name is Brad Broyles and my dads name is Jim. 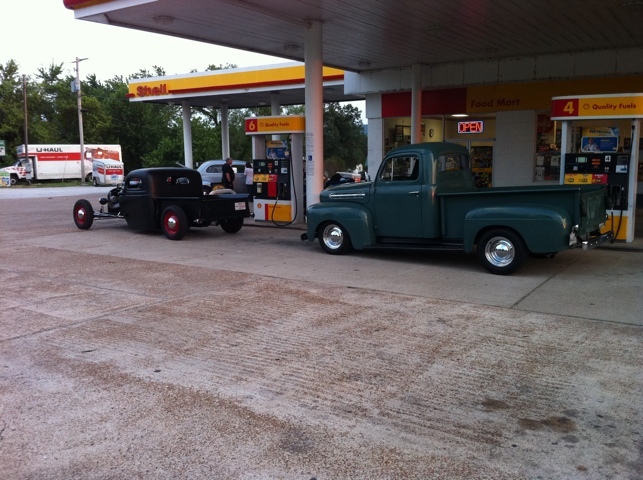 Thats my 45′ dodge rat and my dads 51′ f1. It was great to meet you and hope you stop by next time you in town. I am sorry for being terrible with remembering names! It was way cool to catch up with you and your dad. I honked when I came back through Mountain View, but that was Saturday evening, and there wasn’t anyone at the shop. I may be blasting back through there next week, as I have to follow up on an opportunity that came up while at the golf tournament. Say hey to your dad for me, and happy fathers day to you both!